Happy New Year! I hope you had a joyous and blessed Christmas. 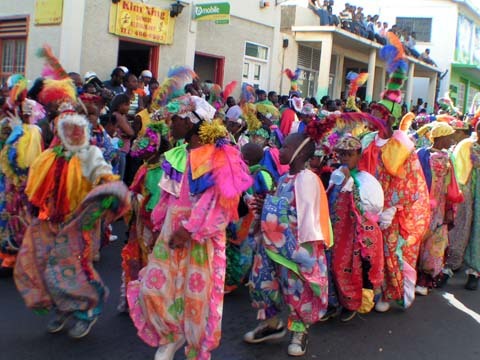 For those of you who journeyed to St. Kitts, I trust that you will share your your thoughts about Christmas and Carnival with the Discover St Kitts Nevis Beaches online family either via the forum or by sending a trip review or audio review. Welcome to the Special Holiday and Carnival 2005-2006 issue of the St. Kitts and Nevis Beach Buzz. This special issue replaces the regular issue of the St. Kitts and Nevis Beach Buzz. First, let me apologize for the late publication of this issue. I know I promised that it would be out the week before Christmas, but in this case I hope that better late than never will suffice for you my dear readers. Unfortunately, there was a bereavement in my family and I had to travel to the United States Virgin Islands the weekend before Christmas for the funeral. What a hassle it was getting flights to and from the USVI. Flights were booked solid so in order to get there I had to go via San Juan on Caribbean Sun. As I hadn't travelled around this time since I was at University in the mid 1990s, I had forgotten how hectic it was to be flying to and from St. Kitts close to Christmas. Don't worry too much about the hassles though; what lies in store for you here in St. Kitts during this festive season is well worth it... Just ask the thousands of visitors and nationals who make the journey at this time of year. 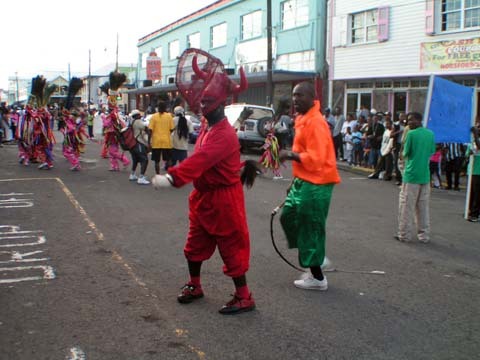 In this issue, the featured photos will highlight what I consider to be a very important aspect of the Christmas and Carnival Season here in St. Kitts, the folklore groups, also known to some of us as the Christmas Sports. The 2004-2005 Carnival Photo Album that I promised you is not available as yet, so instead of holding back this issue until it's ready, I've decided to go ahead with this publication. I will make the appropriate announcement via RSS when the album is ready. My humblest apologies for not having the album ready. However, I have the 2005-2006 Cable & Wireless Children's Carnival Parade Album ready for you to view. Enjoy! As we start the New Year, let me express my sincere gratitude and appreciation to all of you for being a part of the Discover St. Kitts Nevis Beaches online family in 2005. Thanks for all the words of encouragement and support sent via e-mail, instant message (IM) or expressed whenever we had an opportunity to meet face to face. A special thank you to those who sent donations just as a token of your appreciation or to help support the further growth and development of Discover St. Kitts Nevis Beaches. Thanks also to those of you who treated me to breakfast, dinner or cocktails when we got together. Your encouragement, support, kindness and generosity were very much appreciated over the past year. I look forward to your continued support in 2006 and beyond. In one of my earlier newsletters I promised that I would be adding some creative content to my site using audio and video. As of this issue, I am pleased to announce that I have added a new video clip of the Masquerades performing. The masquerade video is about 14 seconds long and was shot using the video function on my digital camera (still). Unfortunately the capacity of the card I use in my camera is not sufficiently large to allow me to store photos plus more than a few seconds of video. In the future I hope to continue adding video clips to my website, subject to the limitations of my current equipment. This year I am hoping that I will be able to add a digital video camera to my equipment list, to enable me to share more video content with you. If you would like to support my efforts to bring you more video content, please consider making a donation to the DSKNB Video Project. (Please note that I use PayPal to accept online credit card donations, so you will be taken to the secure Paypal website where you can enter the details of your donation. You do not need to have a PayPal account to donate. PayPal processes credit card payments.) In a nutshell, the objective of the project is to purchase the necessary equipment, hosting and bandwith facilities to enable me to shoot and host video content about St. Kitts and Nevis on the Discover St. Kitts Nevis Beaches website. 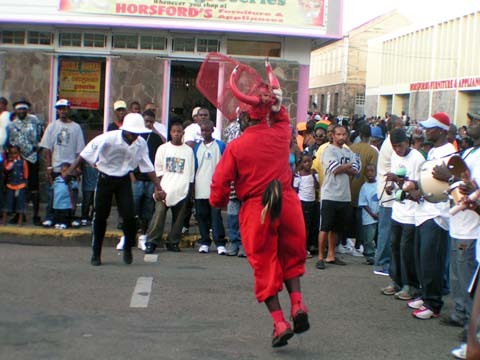 To view the masquerade video please visit the St Kitts Masquerades Video and Photo Page. Alternatively, you can view the video by clicking on the first masquerade photo on the right hand side of the Discover St Kitts Nevis Beaches home page. 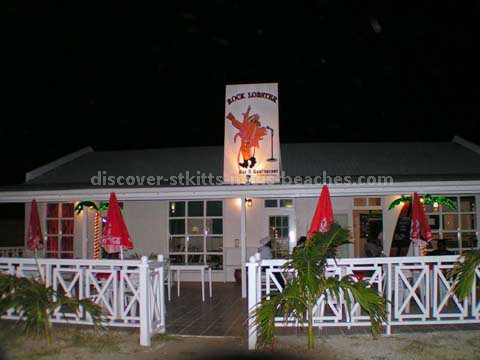 Rock Lobster, a new bar and restaurant located in a detached building in the St. Christopher Club complex, opened its doors to the public on December 2, 2005. The restaurant is owned by Giles and Debbie Lines who used to run Grumpys. It is open for breakfast, lunch and dinner, with the dinner menu being a la carte. Opening hours are from 8:00am until about 10:30pm. Prices range from US$5 - $30 and meals are served with a choice of mashed potatoes or rice, vegetables and salad. The food at Rock Lobster is great, but just don't take my word for it. Next time you are in St. Kitts, do check them out yourself, and let me know what you think, by sharing your restaurant review. Meanwhile, take a look at these photos I took at Rock Lobster when I had dinner there on Saturday December 10, 2005. 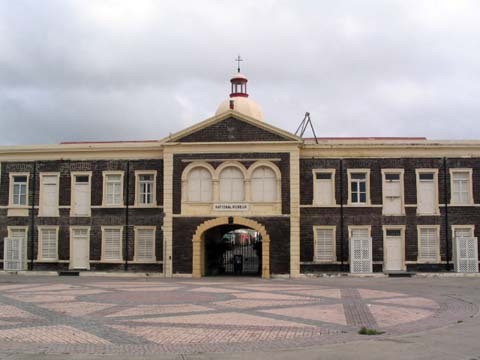 December 15, 2005 marked the re-opening of exhibitions on the refurbished first floor of the National Museum Building (formerly the Old Treasury Building) on the Bay Road in Basseterre. Currently a Carnival exhibition is mounted. 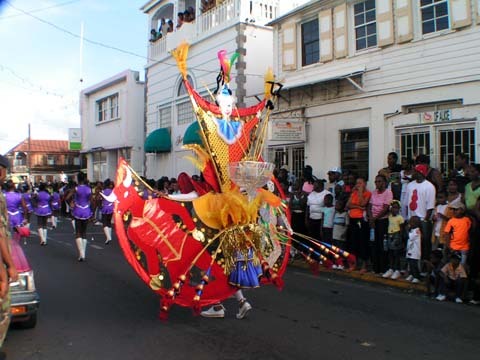 It showcases photos of carnival costumes, the names and photos of past Carnival Queens and Calypso Kings, information and photos about our folklore as well as costume displays. A new museum shop now occupies the space that was previously occupied by the museum. If you'll be in St. Kitts anytime soon, do stop by the National Museum on the Bay Road to check out the Carnival exhibition. The entrance fee is just EC$2.00 for nationals and US$2.00 for non-nationals. 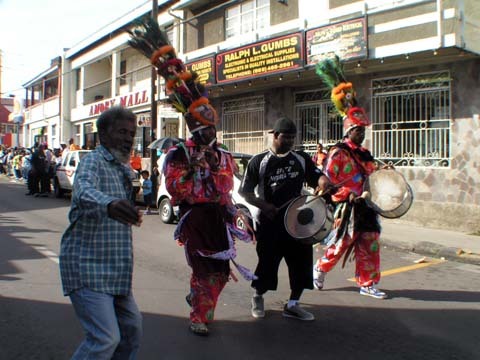 Celebrated under the slogan "Rhythm, Sweetness and Plenty Lime... Keep the Culture Alive", St. Kitts Carnival 2005-2006 is almost over. In fact, J'ouvert and all of the National Shows have come and gone. So too has the Cable & Wireless Children's Carnival Parade. 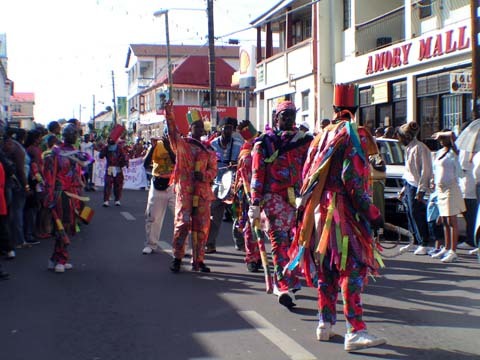 Unfortunately I did not take any photos of J'ouvert this year, however I do have some photos of the Children's Carnival Parade as well as a video and photos of masquerades performing at Cunningham Street in Basseterre. In the next issue of the St. Kitts and Nevis Beach Buzz I will have more Carnival video clips and photos for you to view. "Nevis as We See Her: Goin' to Come Back" is a new book on Nevis by Rosemary Willis Sullivan and MaryJo Cannon. It is the first book in a series of six that will feature photos and oral histories of people who love Nevis. Although I haven't read the book as yet, I am sure you will enjoy looking at Rosemary's photographs. In fact, if you have visited the reading room at the St. Christopher Heritage Society in the National Museum Building, you may have already seen some of Rosemary's photos printed on a patchwork quilt that is prominently displayed in the reading room. "It is so warm. I feel like I am there....on Nevis." "I love the book, it just 'glows." "I can feel the joy of the people"
"Can't wait to see Nevis for myself"
Rosemary and MaryJo will be launching the book on Nevis in January 2006. 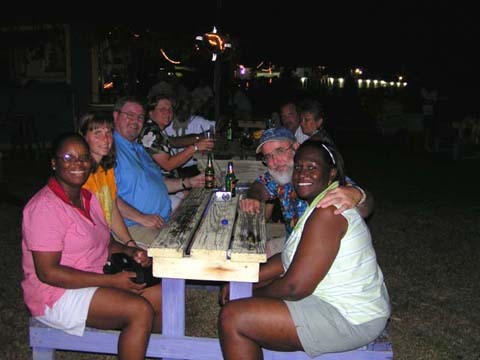 If you are planning to be in St. Kitts on January 19, 2006, please feel free to join the Discover St. Kitts and Nevis Beaches and Myeyez travel forum members and friends at their first link up for 2006. The link up will be held at Mr X Shiggidy Shack on South Frigate Bay Beach from 6pm. Liz Pereira will be down from Toronto and says she will be the one in T-shirt with the St. Kitts Flag on it. Also in attendance will be Joan Harrington, author of Live De Life: Caribbean Island Style as well as several other travel forum members including Paula, Ms Jilly, Craig and Bob. I am hoping to be there as well, provided that my job does not take me off island. So do join us if you will be on island. Looking forward to seeing you there! To view photos from past link ups visit http://www.discover-stkitts-nevis-beaches.com/st-kitts-nevis-forum.html. 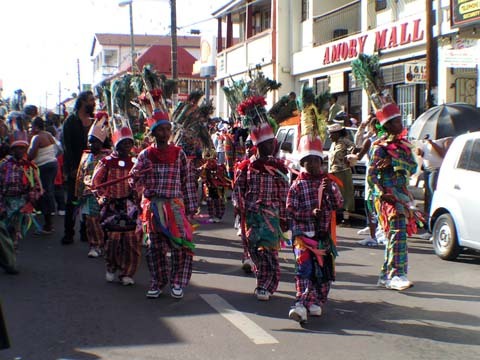 During the Christmas and Carnival Season in St. Kitts, the local folklore groups (the masquerades, mummies, clowns, mummies, actors, bull and big drum band) come out to entertain nationals and visitors. When I was growing up we referred to the folklore as the Christmas Sports. According to tradition, the origin of the Christmas Sports goes back to the glory days of sugar, when the slaves and the ex-slaves (post emancipation) were allowed to to party and enjoy themselves on the days between Christmas and the start of the New Year. Today, some of the earlier Christmas Sports such as Sagwa, Cowboys and Indians, and Neaga Business have more or less disappeared, but the elders in society have many stories to share about them. 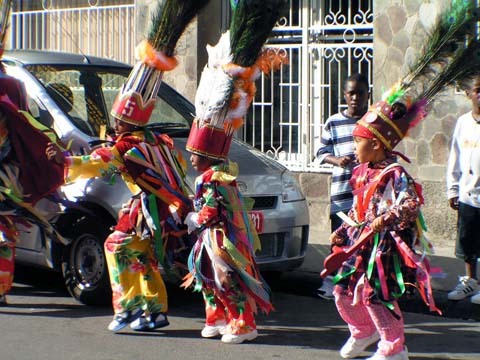 The Masquerades, once known as the Indians, dress in colourful costumes decorated with ribbons, bells and mirrors. Their headpiece is decorated with peacock feathers. The Big Drum Band provides the musical accompaniment for the various folklore groups. Some of the instruments they use include the bass drum, kettle drum, triangle and fife. Another Masquerade group dressed in costumes made from madras. Despite the difference in costumes, they go through the same dance performance. It is said that the Mummies are a creolised version of the English mumming tradition. The large sticks they carry are used in their mock fights during their performance. The Clowns wear colourful baggy costumes, with bells attached and wire masks on their faces. They also carry whips (known as "hunters" in local parlance) made from plaited cattle skin. In years gone by they were accompanied by Millionaires and Japanese girls. 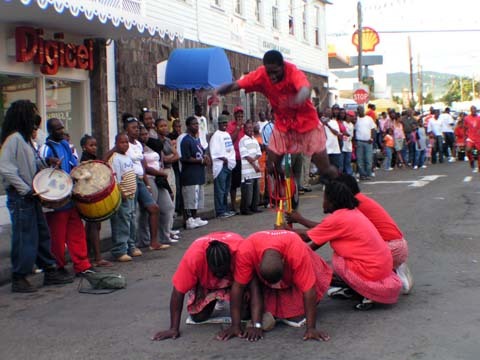 The Moco Jumbies dance on stilts in the streets. 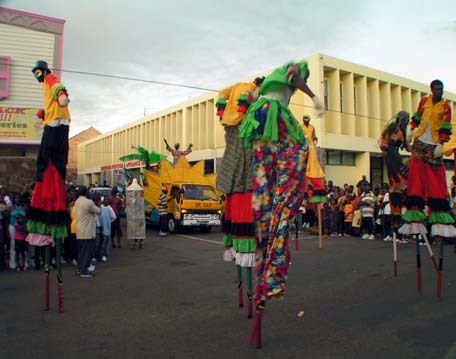 Originating from West Africa, tradition has it that the Moco Jumbies are mediators between the living and their ancestors. The Bull is a re-enactment of an incident that occurred in the early 20th century at Belmont Estate. It involves a fierce bull being knocked unconscious then being revived by the vet. After it was revived the bull charged after the spectators who were watching on. It is said that the Actors date back to the 17th century when they provided entertainment for French Governor De Poincy. Their performance includes jumping over upturned pitch forks and breaking large stones on their stomachs. Today there are a few bull troupes including those from Mansion and St. Pauls. The photo above is of the Mansion Bull. "Just wanted to let you know that everything went perfectly with our rental car; Avis location easy to find, no problems getting the car, and it was very easy getting around the island. We really enjoyed St. Kitts (beautiful beaches!) and would definitely like to visit there again and explore more of the island. Thanks for all your help in answering my questions." My husband and I just spent a week in St. Kitts in August, and we are truly enjoying the Beach Buzz. We have never been on a vacation where the local people were so warm and friendly. By reading the Beach Buzz, it feels like we are able to keep in touch with the wonderful people we met. We are anxiously awaiting another vacation to your beautiful island!" "I find it a fun (and non-political) way to stay in tune with the 'SKN happenings.'" The following comments were copied to me by a site visitor who I helped to book a shore excursion with Troy of Caribbean Journey Mastrs, who also operates the Bob and Elvis St. Kitts Party Bus. I was extremely happy to read the positive comments about Troy's services. I must say that I am very pleased with the quality of service that Troy provides. I have received positive testimonials about his services from the site visitors whom I have referred to him. To contact Troy you may use the forms on the Bob and Elvis Party Bus Page or Shore Excursions Page. "Troy - I want to thank you again personally for the fantastic experience you provided my family for our special anniversary celebration. This was, without a doubt, the best shore excursion we experienced on our entire cruise. Everyone was delighted with the unique, quality tour you afforded us. I will definitely post a highly positive review of your services and will recommend you to anyone requesting a reputable & reliable shore excursion company. I look forward to being able to book your services in the future when we return to your beautiful island. Thank you again and please relay our gratitude to all your fabulous employees!" "He (Troy) made our family excursion a truly enjoyable & highly memorable one. Our driver was excellent and the tour guide friendly & informative. The food & local drinks were delicious & added immeasurably to the festivity! Troy demonstrated the ultimate in superior and respectful service to all of us. My father, in particular , really enjoyed his company!! We will also send the photos we took of the entire group as testiment to our fantastic time in St. Kitts. Thanks for your help in accommodating our group!" However, if you'd like to show your appreciation to me for bringing you information, tips and advice to help you get the most out of your time in St. Kitts and Nevis - here is your opportunity! Show how much you enjoy reading the St. Kitts and Nevis Beach Buzz, browsing through Discover St. Kitts Nevis Beaches or interacting with other St. Kitts and Nevis lovers on the St. Kitts and Nevis Travel Forum, by supporting my efforts to continue bringing more of St. Kitts and Nevis to you. Click here to donate to Discover St. Kitts Nevis Beaches. (Please note that I use PayPal to accept online donations so you will be taken to the secure Paypal website where you can enter the details of your donation. Please note that you do not need to have a PayPal account to donate). Alternatively, you can make a donation by going to the homepage on my website and clicking on the donation button in the right column of the page. This will take you to a PayPal page where you can enter the details of your donation. The St. Kitts and Nevis Beach Buzz is a monthly newsletter dedicated to helping you get the best from your vacation in St. Kitts and Nevis. We aim to publish the St. Kitts and Nevis Beach Buzz on the last Thursday of each month. However, at times for reasons beyond our control, the publication may be delayed by a few days. I hope you will have lots of fun reading it and will find the information, tips and advice, helpful in planning your trip to our beautiful twin-island Caribbean paradise. Although I have quite a lot in store for you, I would be happy to receive your comments and suggestions for future issues of the newsletter. Please feel free to share this newsletter with your family and friends, or better yet, please direct them to the newsletter signup page at http://www.discover-stkitts-nevis-beaches.com/ezine. Remember, you may qualify to win exciting prizes just for subscribing to the St. Kitts and Nevis Beach Buzz. I'd love to hear from you! Please share your comments with me in the box below.